When Marie Stopes (1882-1958) first began her crusade for birth control and better sexual knowledge, she was horrified to discover that a significant proportion of the correspondence she received following the publication of her books Married Love and Wise Parenthood in 1918 consisted of requests for the termination of a pregnancy already begun, rather than the prevention of potential pregnancies. A similar phenomenon greeted the opening of her Mothers’ Clinic in Upper Holloway, London, in 1921. Desperate women (and some men) sought her advice on how to intervene in suspected or confirmed conception. In her public statements, Stopes was adamant that birth control was nothing to do with abortion and that wider knowledge of sound methods of contraception would obviate the large number of abortions. As abortion, even by medical professionals was illegal at that date, and often conducted in dangerous and unhygienic circumstances, this was the strategic line to take. She also endeavoured to pursue with legal force the manufacturers of supposedly abortifacient pills who used her name in their advertisements. 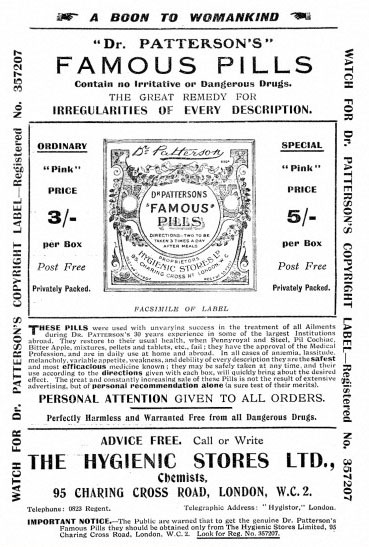 Advertisement for Dr. Patterson’s famous pills. However, in private correspondence with specific individuals, Stopes was sometimes more sympathetic. In cases where a delayed period was causing anxiety, she occasionally advocated the use of Widow Welch’s Female Pills, as an emmenagogue. In a few cases which seemed to her particularly deserving, she was prepared to go further and recommend ‘evacuation of the uterus’ and even to pass on the name of doctors who were known to be prepared to perform abortions (usually for a price). This prudent line was continued by the National Birth Control Association (subsequently the Family Planning Association) when it was established to coordinate the activities of the various groups running clinics or lobbying the government for legislation to permit birth control advice in local authority welfare centres. There is some evidence from oral history that in at least some clinics, the workers were prepared to assist in procuring abortions by qualified medical personnel. But since abortion was still illegal (even if performed by a registered medical practitioner) this would not be recorded at the time. During the 1930s awareness was growing of the high level of ‘backstreet’ abortion either self-induced by women or performed by some local person known to ‘help out’, with their significant death and morbidity rate. There was also a widespread belief that wealthy women were catered to by profiteering Harley Street doctors prepared to risk the law for a good price. There were increasing calls for a reform in the law and in 1936 an Abortion Law Reform Association was established. 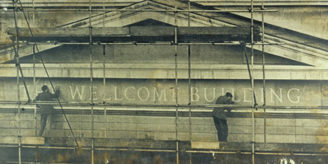 In spite of the severe constraints upon advertising its presence and the difficulties it faced in setting up clinics, the birth control movement continued to expand quietly throughout the 1940s and 1950s, although contraceptive services were not included in the National Health Service when it was set up in 1948. 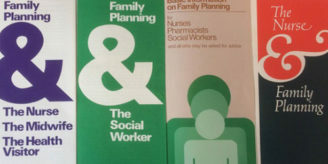 The Family Planning Association remained the main provider of these, though it also trained general practitioners who wanted to develop these skills. During the 1960s birth control gradually became a more respectable cause. The Pill was introduced in the early 60s, and in 1967 the Labour Government finally passed legislation permitting, but not requiring, local health authorities to provide free contraception. In the same year Liberal MP David Steel’s Private Members Bill for abortion law reform was finally passed, with significant support from the Abortion Law Reform Association. This had been given a new lease of life when the thalidomide scandal revealed that it had been legal to prescribe this drug but that it remained illegal for a pregnancy affected by it to be terminated. For many decades London Underground had refused to carry even the most discreet advertisements for FPA clinics, but by the 1970s posters advertising the British Pregnancy Advisory Service, a non-profit abortion provider, began to be seen along the sides of the escalators. Television commercials for contraception lagged significantly behind. It was only with the advent of the AIDS/HIV epidemic in the 1980s that advertising for condoms, previously very discreet, became more high profile. It is therefore remarkable that at last, nearly ninety years since Stopes opened the first birth control clinic in the UK, eighty years since the Ministry of Health first permitted the giving of contraceptive advice in maternal welfare clinics to women whose lives were threatened by another pregnancy, that there is at least a strong possibility that an advertisement for abortion advisory services by the sexual health charity Marie Stopes International – based in the Whitfield St London WC1 premises to which Stopes moved her own clinic in 1926 – may finally appear on television. 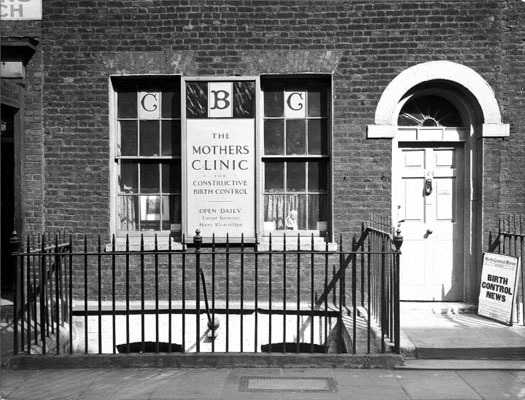 Facade of the mothers clinic for constructive birth control. This story of the long slow road to visibility and acceptability of the right to control reproduction is reflected in numerous collections in Archives and Manuscripts in the Wellcome Library. We hold a large collection of Marie Stopes’ own papers (including thousands of letters from her readers); the archives of the Family Planning Association and of the Abortion Law Reform Association; and even a small group of surviving papers of the Widow Welch’s Pills company. An overview of our copious holdings relating to birth control can be found here. The Library also holds numerous relevant published works and ephemera. it is ironic that you call the advert the 'long slow road to visibility and acceptablity' given the fact that so many people oppose the ad, and secondly given that Marie Stopes are anything but truthful in their ad – they don't even mention abortion – and they certainly don't show the reality of the unborn child – that they are responsible for terminating, neither do they offer any alternatives at all to support women to keep their baby. Abortion will never be acceptable – and Marie Stopes will never tell people the truth about abortion – because the truth of killing unborn babies is horrific.